Rhododendron ‘Cunningham’s White’is a rhododendron hybrid that dates back to 1830. This classic hybrid has remained continuously popular among gardeners, which is largely due to its exceptionally robust and tough nature. Rhododendron ‘Cunningham’s White’ is more hardy (down to -15C) and less sensitive to poor conditions than most other rhododendrons, tolerating even neutral or slightly chalky soils, which is unusual for this otherwise acid loving species. Another explanation for the popularity of this very reliable hybrid can be found in the fact that it has a dense and compact growth habit, which makes it a marvellous choice for screens and windbreaks. ‘Cunningham’s White’ is easy to grow and does not require regular pruning, except for overgrown plants, which can be cut back immediately after flowering. Watering in dry periods is crucial, as rhododendrons have surface roots, but it is best not to overdo it. Although it is tolerant of most conditions, it has a preferences for acidic, humus-rich, well-drained and moist soils. 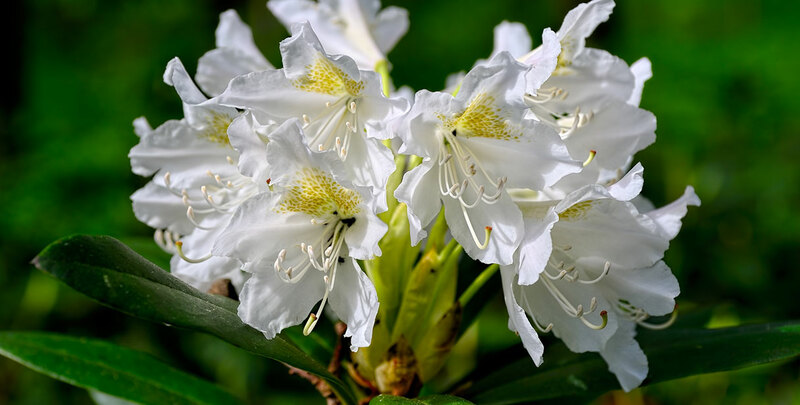 Rhododendron ‘Cunningham’s White’ will grow up to 2m tall at an annual growth rate of approximately 20cm. In addition to its strong character it also has a lot to offer when it comes to appearance. Rhododendron ‘Cunningham’s White’ features loose trusses of bell-shaped white flowers with a yellow eye, which open from mauve buds. The flowering season lasts from May to June and during this period the striking flowers make a beautiful contrast to this evergreen hybrid’s dark green leaves, which are retained throughout the year. Rhododendrons are suitable for both formal or more informal hedges.